And today’s question comes from The Daily Retort‘s Tor Constantino, who seems to be skeptical of the authenticity of The Good Greatsby’s glasses. Are those prescription glasses you wear in your photos or are they simply the fakey fashion kind to make you look smarter – know what I mean? Some people dress up to come off as more erudite, by wearing things like…oh I don’t know… a brocaded smoking jacket or holding a pipe – stuff like that. I only ask because I really want to make sure that you really are smart before I ask my question. Thanks. 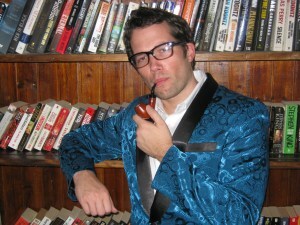 First of all, I can confirm the smoking jacket was prescribed by a doctor…me, Dr. Life of the Party, M.D. On the other hand, the pipe isn’t real, and if you zoom in on the picture you’ll notice it’s actually a half-eaten bran muffin, although the bran muffin was prescribed by a doctor. One accessory you can’t see in my pictures is that I’m wearing corrective leg braces, which were definitely not prescription and were part of a new look I was trying calling the ‘Erudite Cyborg’ (copyright pending). I’m also wearing pie tins on my feet to make me sound more intimidating when I approach. Are you suggesting Justin Bieber CPA might be deceiving us with these glasses? artificially restyled into an unnatural state, and the most shameful thing is that I can’t even do this myself but have employed my wife to reshape it, often in overly flamboyant styles she knows will make women assume I’m gay and leave me alone. My words can also be a bit fake. Sometimes I say, “I couldn’t care less,” but when I think about it I realize I probably could care less if I really set my mind to it, and this makes me feel guilty. Most of my anecdotes are fake. They did in fact happen, just not to me, and were stolen from the much more interesting lives of the Beatles, Cart Grant, and Harry Potter. I understand it’s very common to wear fake glasses to try and appear smarter, and this may be frustrating to people who actually need glasses and feel looking smarter is the trade biology gave them for bad eyesight, but I’m not sure the glasses actually make me look any more intelligent anyway. If I look back at all the jobs I’ve ever had–and I would assume I got those jobs because I made an impression of competence and intelligence–I always had more success when I wasn’t wearing glasses, or even a shirt, but was actually only wearing a swimsuit. Now before I answer your question about the glasses so you can decide whether I’m truly smart or just pretending to be smart, allow me to ask: If you need someone smart to solve your problem, and I assume you mean someone smarter than you or you would have solved the problem already, are you sure you’d be smart enough to recognize this someone smarter than you? I was just wondering, does your insurance fill prescriptions for smoking jackets? And if so, what kind of co-pay are we talkin’? I’ve never encountered a plan that will pay for a smoking jacket; it seems for some reason health insurance companies associate smoking jackets with smoking. At least it’s easier to poke their eyes out with a pointed stick. Everyone knows if you wear the fake glasses, you’ve got to wear the lenses so you can claim you’re wearing fake glasses as a defense against poking your eyes out. Clearly, your performance-enhancing prescriptions have served you well on all fronts. Although, I wonder if the prescribed smoking jacket is the “extra strength” formulation or merely some Asiatic generic knockoff. Regardless, you’ve once again proven your mental acumen and are definitely smarter than me. With that, I have a truly vexing question that demands your immediate, full cogitative capacity. In fact, the economic survival of humanity hinges upon your answer. My critical world-changing question is….ohhh, lookey there’s a butterfly…. You and Bieber differ immensely………Bieber has no talent…. You’re too kind. If only my talent had been rewarded with $52 million last year. And to think all this time I’ve been swapping out my contacts for glasses when I have interviews when I could have just worn a swimsuit. What if I wear a swimsuit and glasses? Too much? Are you interviewing as an accountant at a water park? Okay, I can top this sartorial trick–my mother wears clothes pins to appear smarter–sort of. Check out a post called “Memory Mining Via Haute Couture” for proof of my mother’s fashion accessory sense. Dr. Life of The Party, I got a little attached to the fake glasses that came with my Where’s Wendy? costume. I’d like to wear them out in public but am terrified that someone will realize they are plastic. Question: Do people who genuinely need glasses make a habit of swatting people’s hands away if they try to touch their real, prescription, glass-lens-and-all glasses? I bet if you also wore your Where’s Wendy ski cap, nobody would even look at the plastic glasses. I don’t know how common it is for people to reach out and grab someone’s glasses off their face. This rarely happens to me because people have heard if I see hands coming towards my face, I assume they intend to strangle me, and I take defensive action. Did you really type that, Dr. Life of the Party, MD? By the way … your bifocals are showing. I only typed it if you thought it was funny. If not, my wife sometimes sneaks onto my computer and changes lines to make me look bad. I think you should have asked to see if Mr. TorCon had a prescription for his “about to break into original poetry” glasses, before dignifying his question with a response. I vote fake…your head isn’t two different sizes when you look into the lenses. If you look into my glasses, my head is significantly smaller which means I am close to blind. I could strap two coke bottles to my head and see great! I think you look a little like Paul Rudd w/out your glasses. 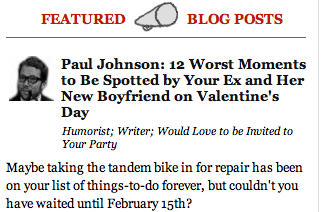 Maybe you really “are” Paul Rudd and not Paul Johnson? My wife loves Paul Rudd; I’m going to try and play up that angle. I always thought people looked smart when they took the glasses off and thoughtfully chewed on the little plastic bit that rests behind the ear. I can’t be bound by the limitations of the existing dictionary. Your pipe is really a bran muffin? How do you keep it lit? Mine don’t burn so well – at least, not once I take them out of the oven…. I don’t actually smoke the bran muffins. I just make them look like pipes so the kids will want them because kids always think smoking is cool. Do you give muffin-carving classes? That pipe sculpture is amazing. Your wife does a good job with your hair. Are a smoking jacket and a strait-jacket the same thing? If I’m ever institutionalized, I’m going to ask if I can design my own straight-jacket. That Justin B photo has a striking resemblance to you! Love the glasses. I also accessorize so that I get the more intelligent look…. Some how it doesn’t have the same effect with me! Some people wear fake glasses to look smarter? Unbelievable! My glasses are real, BTW. Those glasses may be real, but what about your head and torso? I wear fake glasses to take the SAT, because they make me feel smarter.